Thailand is covered in beautiful areas of forest, with the Ministry of Natural Resources and Environment working toward a goal of 40% forest cover by 2036. As of 2015 there were 147 registered national parks in Thailand, but with so many options it can be difficult to know where to start! We’re fortunate enough to live in this beautiful country and over the years have visited a large number of its parks, so we’ve put together a selection of what we believe to be the best national parks in Thailand. We couldn’t possibly rank these Thai national parks against each other. They are each unique in their own way and appeal to different visitors, but this list is of our personal favourites and includes something for everyone. We think you’ll love them too. Read on to find out more about what our beautiful country has to offer. A Thai national park since 1975, Namtok Phlio is located on the coastline near the Cambodia border. The park is renowned for its waterfalls and is home to two memorial buildings (stupa) from the reign of King Rama V, dating from the late 1800s. The park takes its name from the Phlio waterfall, which culminates in pools that are home to a number of fish including Mahseer Barb and Soro Brook Carp. Due to the freshwater and abundant fish, Namtok Phlio park has an active bird population, making it a great choice for visitors who enjoy birdwatching. The waterfall, pools and stupas are all within short walking distance of each other, so while this isn’t a full day out, it’s a great place to stop if you’re crossing the border to/from Cambodia at Ban Pakard or Hat Lek. While not as aesthetically notable as some of the other areas of the country, Pha Taem makes our list of the best national parks in Thailand because of its prehistoric artefacts. A great outing for budding archaeologists big and small, you will find the park in the east of Thailand, along the border with Laos. 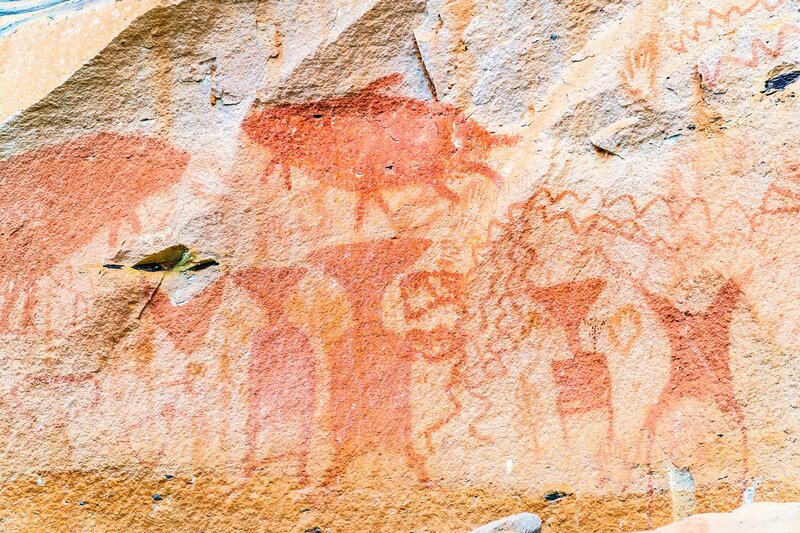 Visitors to this Thai national park will find numerous cave paintings, thought to be 3,000-4,000 years old featuring pictures of fish, elephants, turtles and some rather strange, triangular headed figures. Between the unsettling, almost alien-like paintings and the peculiarly shaped mushroom rock formations, this is the most eerily beautiful national park in Thailand. Located north of Surat Thani province, in the Gulf of Thailand, stands the stunning marine park of Mu Ko Ang Thong. An archipelago of 42 islands, the name Ang Thong means ‘golden basin’ and was the inspiration behind Alex Garland’s ‘The Beach’. 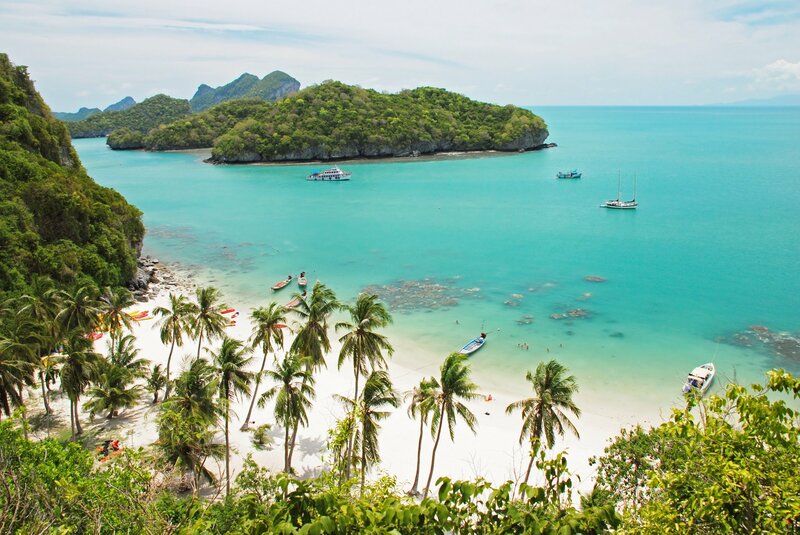 Unsurprisingly this Thailand national park is a popular spot for snorkelling. The islands can only be reached by boat, so your options are to either join a tour, or get your own group together and have a private boat and guide. We recommend the private option if you want to explore at your own pace and have the freedom to change snorkelling spots at will. Expect to see angelfish, butterflyfish, parrotfish, stingrays and even large sea cucumbers. 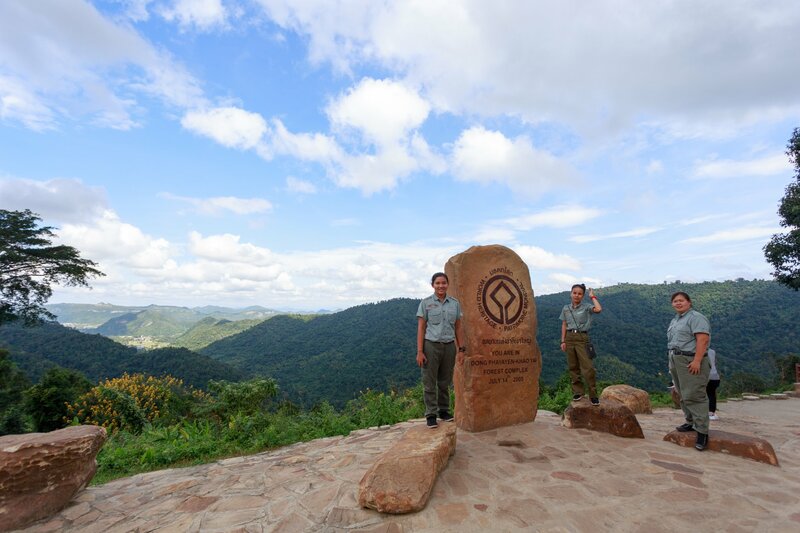 The largest of the Thailand national parks, Kaeng Krachan covers an area of 2914.7 km2 and lies predominantly in the Phetchaburi province in the west of Thailand, near the border with Myanmar. It can be reached by Bangkok in about 3 hours and is also near the popular seaside resort of Hua Hin. Its location makes it an easy journey for visitors to Thailand, and the park itself is well worth the trip. 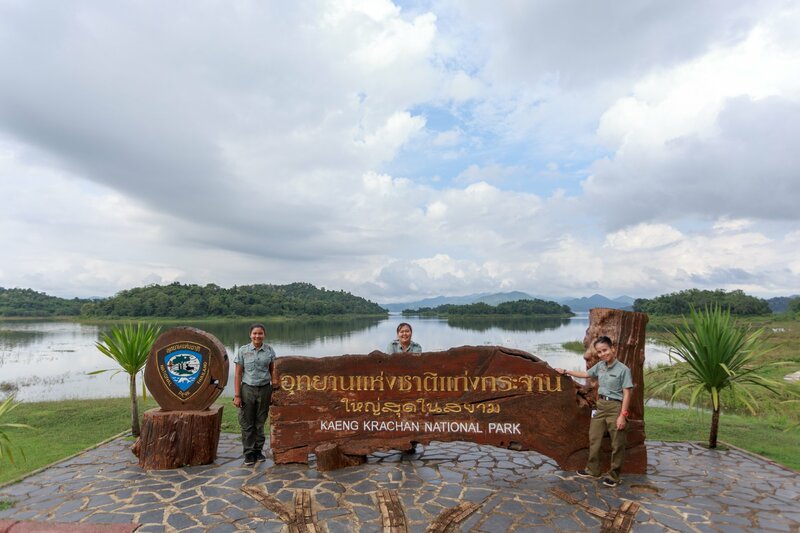 Due to its sheer size, the geography of this Thai national park includes lakes, mountains, rainforests and rivers – in fact two main rivers originate from Kaeng Krachan’s Tanaosri mountain range. This park is particularly well suited for bird and butterfly enthusiasts, with around 400 varieties of the former and 300 of the latter. 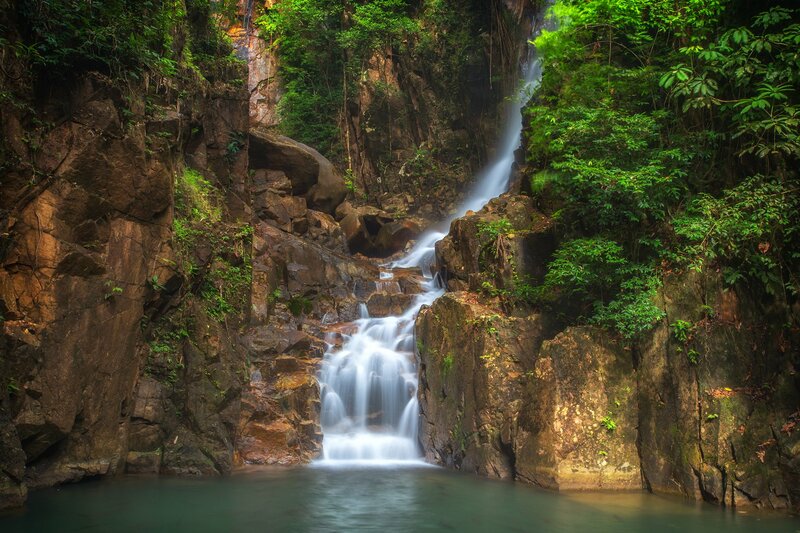 Located three hours’ drive north-east from Bangkok, Khao Yai is not only the third biggest national park in Thailand, but was also the first of the Thailand national parks to be established, which we think is pretty special. It has over 50km of hiking trails, making it great for the athletic tourist. It’s worth noting though that you’re encouraged to hire a guide for any trekking you may do, unless you have mapping experience. The park is home to many varieties of wildlife, notably wild elephants and large cats including the Asian Golden Cat, Leopard Cat, Marbled Cat and Clouded Leopard. Khao Yai National Park was at one stage home to Indo-Chinese Tigers, but none have been seen for over a decade, suggesting they may have fallen victim to poachers. Erawan is very popular and can be more crowded than some of the other Thailand national parks, we still feel it warrants a visit though because of the Erawan Falls. 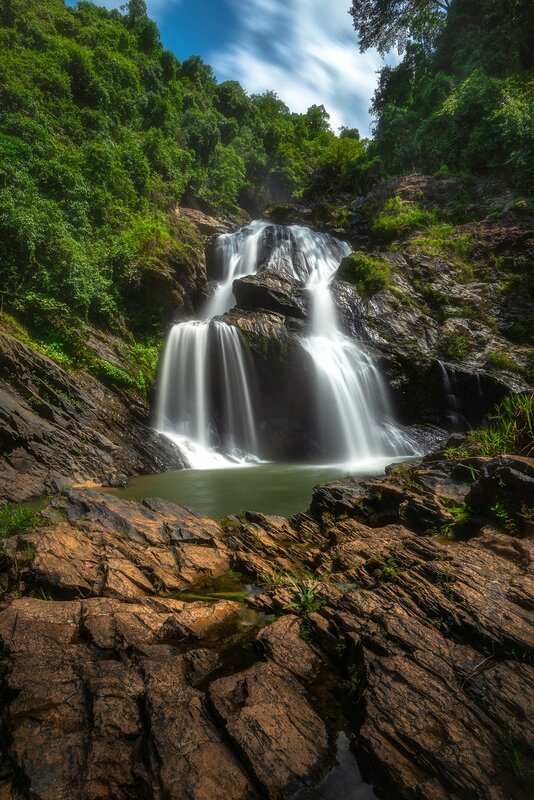 The waterfall consists of seven major tiers, and is interspersed with spectacular, emerald green pools, some of which visitors are permitted to swim in. The top tier is said to resemble Erawan, the three-headed white elephant from Hindu mythology. Walking from the visitors centre to the top of the falls is around 1.5km, so can easily be done as a short side-trip on your journey elsewhere in the region. 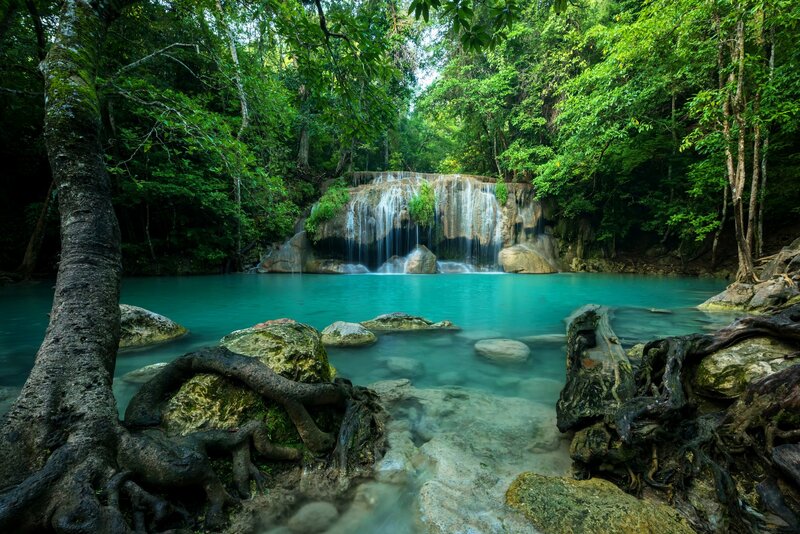 We recommend visiting Erawan National Park midweek and arriving early in the day in order to best avoid the crowds. Known for its caves and large freshwater marsh – the biggest in Thailand – Khao Sam Roi Yot National Park was the country’s first marine park and is located in the Prachuap Khiri Khan province. Around 300 species of birds can be seen in the park, with 150 of those being migratory; it is considered by many to be the best of the Thai national parks to view migratory birds in January/February. 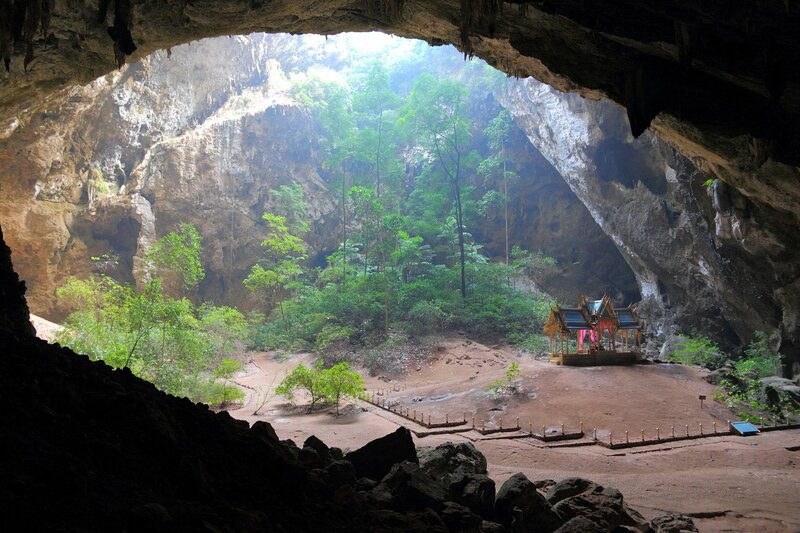 What makes Khao Sam Roi Yot National Park stand out amongst the 147 other national parks in Thailand is the pavilion in Phraya Nakorn Cave. The pavilion was constructed in 1890 for the visit of King Rama V. Due to the sinkhole above the cave, at certain times of the day, the sun illuminates the pavilion below, making for a fantastic photo opportunity. 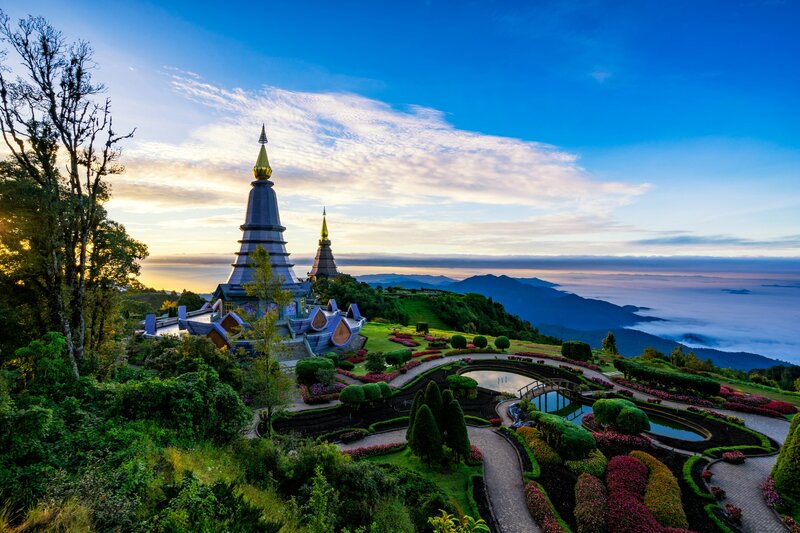 Known as ‘the roof of Thailand’, Doi Inthanon National Park is in the Chiang Mai province of Thailand and was named after a former king of the province, King Inthawichayanon. The park is actually part of the Himalayan mountain range and its highest peak is the top of Doi Inthanon, at 2,565 metres; making it the tallest mountain in Thailand. This makes our list of the best national parks in Thailand not for the wildlife (due to hunting and deforestation, elephants, tigers and gaurs can no longer be found in this area), but for the stunning vistas. Whether you choose to time your visit for when the park opens at 5:30, watching the sunrise from the summit; or view the sunset beside the pair of beautiful west-facing stupas, the views are breathtaking. If you want equally stunning views as those found in Doi Inthanon National Park but are spending your time in the south of Thailand, it is worth considering a trip to Khao Luang National Park, located east of Khao Sok. Of the national parks in Thailand lying south of Bangkok, Khao Luang has the highest mountain at a whopping 1,835 metres above sea level. While there isn’t the variety of wildlife here that is seen on the west of the peninsula, it is home to over 300 species of orchid, some of which have not been found in any other location on earth. It is also a popular destination for bird-watchers, with over 200 species listed in the area. Thailand has so much more to offer than you might think. Wherever your interests lie, you’ll find a national park that fits the brief. By visiting any of the national parks in Thailand, you’re also supporting the conservation of these important areas of forest. So, visit, enjoy and if you are able, leave a donation to help invest money back into this beautiful part of the world. What next? 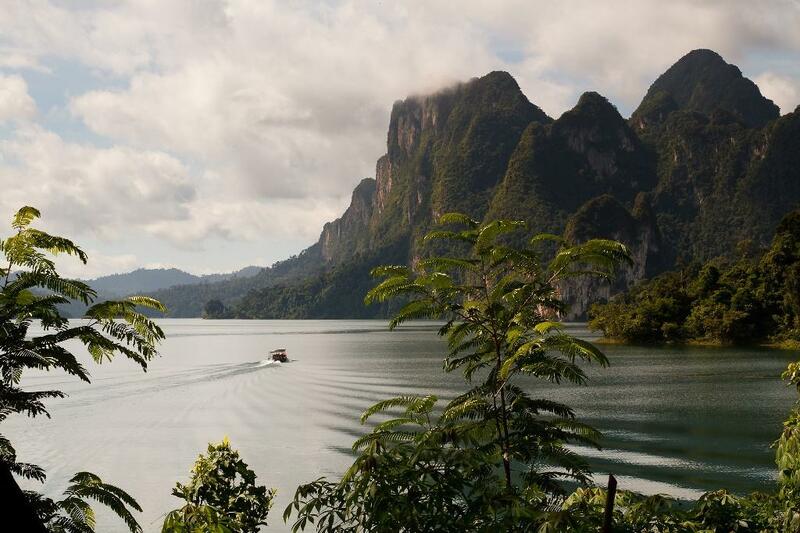 Take a look at our recommended tours in Khao Sok and come visit us soon! We can’t wait to welcome you to our stunningly beautiful part of this planet!